PRO Series Motorcycle Lifts, Automotive lifts, jacks and various shop equipment are high quality and economical. The Wheel Kit and Dolly is a motorcycle lift accessory and is for use on the Elevator 1100 Motorcycle Lift. The 10012 Elevator 1100 Side Extension Kit widens the table top of the Elevator 1100 Motorcycle Lift. 10016 Elevator 1800 or Elevator 2000E Side Extension Kit expands lift width to 56". The 10019 Side Extension Kit expands the Elevator 1800 OR Elevator 2000E Motorcycle Lift to 68". 10021-1 Single panel Super UTV front extension or rear extension fits the Elevator 1800 or Elevator 2000E utv lift tables. 10021-2 Includes 2 panels - Super UTV front extension and rear extension. Fits the Elevator 1800 or Elevator 2000E UTV lift tables. PRO 11000ACD 11,000 lb. capacity lift features asymmetric design, direct drive, and dual cylinder direct pull lifting. PRO 15000CKX 15,000 lb. 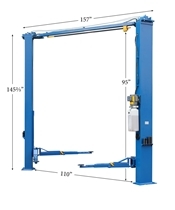 capacity 2 post lift features clear floor symmetric design, and is chain driven. PRO 12000CD 12,000 lb. capacity lift two foot extension. PRO 10000CDTC 10,000 lb. 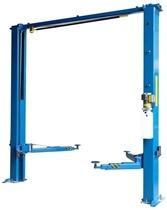 capacity lift features asymmetric design, direct drive, and triple telescoping arms. PRO 10000ACD 10,000 lb. 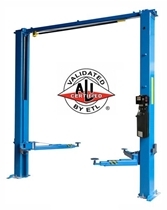 capacity lift features ALI/ETL certification, asymmetric design, and dual cylinder direct pull lifting.